CLAVERIA, Philippines — Typhoon Mangkhut, which meteorologists called the most powerful storm in the world this year, swept through the northern end of the Philippine island of Luzon, leaving at least 16 people dead and wreaking havoc. It uprooted trees, ripped off roofs, set off landslides and flooded farms and roads. But it could be days or weeks before the storm’s true human toll is known. It will also take time to assess how much damage was done to the country’s prime agricultural region and to the economy. Damage to farms could be extensive — and costly for the nation. The region is the country’s largest food producer, and the destruction of crops could lead to food shortages, higher costs and inflation. From the road above Robert Tumaneng’s fish ponds on Saturday, the floodwaters extended as far as the eye could see, with the tips of palm trees and the thatched roofs of wooden shacks barely visible beneath the caramel-colored water. “It was shaking like an earthquake,” said Mr. Tumaneng, 55, a fish farmer in the town of Claveria on Luzon’s north coast. “This storm was different because the wind was low to the ground like it was crawling and destroying everything,” he said after the storm hit. The number of confirmed fatalities is almost certain to rise as people begin assessing damage from the typhoon. But if the numbers are limited, it will be, at least in part, a testament to the preparedness of authorities following disastrous storms in recent years. 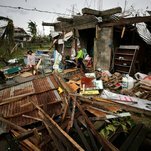 Determined not to see a repeat of Typhoon Haiyan, which killed more than 6,000 people in the central Philippines in 2013, officials had evacuated more than 105,000 people to temporary shelters before Typhoon Mangkhut hit. Communications in the disaster zone were hampered by power and cell service outages, and access was difficult in many places because of flooding and road closures, making it hard to evaluate the storm’s full effect. Trees and coconuts were strewn across the roads, which were deserted except for volunteer crews removing debris and the occasional emergency vehicle. In one community after another, emergency workers reported downed trees and badly damaged buildings. Signs, tin roofs and gates that had been torn free flew about. Among the casualties was a family of four killed when a landslide struck their home in the Cordillera Mountains, south of Claveria, according to a top government official, Francis Tolentino. He spoke in a television interview from the disaster zone on Saturday evening. A CARE Philippines Emergency Response Team that reached the town of Aparri on the north coast reported that some structures were damaged by the storm, including an evacuation center. But much of the surrounding area had yet to be assessed. The typhoon, with wind speeds reaching 170 miles an hour before reaching land, could have caused far more damage if it had hit Luzon farther south and closer to Manila — a megacity of more than 12 million people. The capital was hit by heavy rain and strong winds, with trees uprooted and flooding in some areas. More than 1,600 families were evacuated after the Marikina River, which runs through part of the city, began rising quickly because of runoff from nearby mountains. The police said the body of a child, about 10 years old, was found floating in the river. The area of Luzon that the typhoon hit hardest is primarily agricultural and, with more than four million people, is less densely populated than other parts of the country. In Claveria, a town of about 30,000 in Cagayan Province, the Antonio family was one that did not evacuate — at first. But at about 1 a.m., when strong winds made them fear for their safety, they moved to the shelter of their of their in-laws’ sturdier home. Marck James Antonio, 24, stayed behind and was struck in the right temple by part of the roof that flew off, leaving a big gash. No rescuers have reached the area yet. In the town of Sanchez-Mira, a dozen miles east, local officials said they had ensured people’s safety by pushing them to take shelter at the community hall. Eventually, 271 people complied. Some had to be rounded up by police car. Leaving the Philippines behind on Saturday evening, Typhoon Mangkhut took aim at Hong Kong and southern China, where it was expected make landfall on Sunday. While winds had weakened, forecasts indicated that it would still pack the power of a Category 2 storm when it came ashore, possibly near Maoming, a big petrochemicals center. The area forecast to be affected has relatively few low-lying towns that would be vulnerable to the rising sea levels of a storm surge, and Guangdong, China’s most populous province, has extensive experience with typhoons and is well prepared. If Mangkhut shifts slightly to the north, though, it could hit Hong Kong and the Pearl River Delta area, one of the world’s most important manufacturing hubs and home to more than 60 million people. Hong Kong itself is quite resilient to typhoons and although heavy rain could trigger landslides, the former British colony is not especially vulnerable to flooding with few low-lying areas. The sprawling river delta around it, however, is barely above sea level and has struggled with flooding despite years of investment in drainage systems. Hannah Beech reported from Claveria, Philippines, and Richard C. Paddock from Manila. Kimberly dela Cruz contributed reporting from Claveria, Sol Vanzi from Manila, Jason Gutierrez from Angeles City, and Keith Bradsher from Beijing.